We have not been diving again since we got back from the cruise, but that will all change in the next few days!! We have been gradually acquiring our own gear, and in less than 2 weeks, we should have everything we need to go diving once again! :) We are really looking forward to owning our own stuff so we can take a splash whenever we feel the urge. We have finally gotten some sunshine around here, and it has been lovely!! It's still pretty cool (mid-upper 60's), but at least the sun makes it feel more like summer! :) I must admit, I really miss the thunderstorms of the mid-west. It just doesn't seem like summer without having to watch the skies for tornadoes! We have a new little nephew, born May 28th. 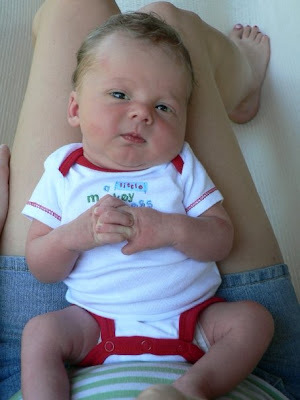 Marshal and Rachel (Tyler's brother and his wife) have added Ryan Caleb to their family and from what I hear, he is a great baby! 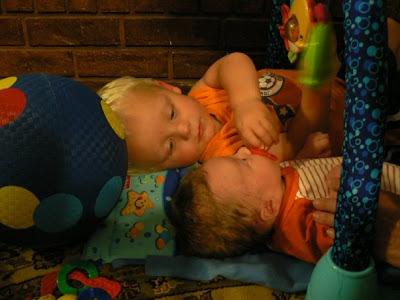 Danny and Ryan playing together...so cute!! And last, but certainly not least, we have company coming next month!! I get to see my parents after being apart for nearly a year! :) I'm really excited to get to hang out with them. So that's what's new with us, what about you? Your parents are excited about coming out to see you, too!!!!!! How long do your parents get to stay?! How fun! they get to stay 10 days!